From the beginning, Jim recognized the possibilities for puppets on television and became interested in all forms of the craft. He joined various puppetry organizations and eventually became president of the Puppeteers of America and the U.S. branch of the international puppetry organization UNIMA. In 1982, Jim founded The Henson Foundation (later renamed The Jim Henson Foundation) to promote and develop the art of puppetry in the United States. Each year, under the leadership of Jim’s daughter Cheryl Henson, the Foundation continues to introduce thousands of adults and families to the magic of puppet theater through grant-making and public awareness efforts. The list of Henson Foundation grant recipients is a who’s who of innovators and masters of puppet theater. While perhaps little known at the time they were awarded a grant, some have gone on to great success in film and theater, making them celebrities in the arts. 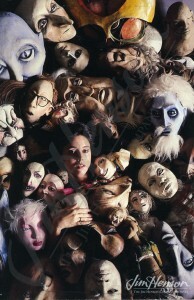 One of the first honorees in 1983 was Julie Taymor and her production of Liberty’s Taken, a tragicomic romance about the American Revolution using a wide range of puppetry techniques. She is now celebrated for her theatrical work in shows like The Lion King, The Magic Flute, and Spiderman: Turn Off The Dark and her film work like Frida, Across the Universe and most recently The Tempest. In 1988, Taymor applied for and received a second Henson foundation grant for her adaptation of Horacio Ouiroga’s short story Juan Darien. This carnival mass, a collaboration with composer Elliot Goldenthal, told the story of Juan Darien, a jaguar cub who, with the love and care of a woman, is transformed into a boy. The version Jim attended on March 12, 1988 was staged under Taymor’s direction by the Music-Theatre Group and was described by historian James Brandon, as having, “…exotic, fantastical beings with whole personalities…” and was “…replete with mysterious shadings and colors.” This certainly would have appealed to Jim and would have provided a pleasurable evening’s entertainment. Juan Darien: A Carnival Mass was revived at Lincoln Center in 1996. Julie Taymor and her puppet from Liberty’s Taken, 1983. This entry was posted in 03-March '88, 1988, Jim Henson Foundation and tagged Cheryl, Cheryl Henson, Juan Darien, Julie Taymor, puppets. Bookmark the permalink.